Listen to WFCC Radio on your phone for continuous classical music carefully crafted to complement the lifestyle of affluent, educated residents, second homeowners and business owners. Classical 107.5 WFCC is a champion of the arts, giving voice to Cape Cod’s vibrant cultural community. 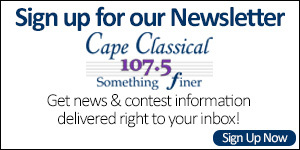 Dowload the FREE Classical 107.5 WFCC mobile radio app to listen to Cape Cod’s Classical Music Station! You may also listen to Classical 107.5 WFCC through the TuneIn App on your Windows Phone, BlackBerry, Android or iPhone or iPad.